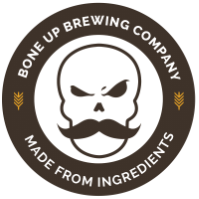 Stats: Nick - Bone Up Brewing Co.
Best Occasion to Drink: Thanksgiving! Table beer’s prickly carbonation, light body, and dry finish make it a perfect companion to a holiday meal, especially alongside heartier dishes where you don’t want your beverage to slow you down! Nick was named after and brewed in memory of our brewer Liz’s childhood pup, a lively, down to earth golden retriever who never missed a chance to sneak a bite of drumstick from under the dining room table. Sweet potatoes added during the mash provide earthy spice, a little body, and some sweetness, complemented by citrusy-earthy Nugget hops for a crisp, bitter finish.